Not all acrylic prints are created equally, so we thought it was important to write up a complete guide to help those looking for acrylic printing services and make an apples to apples comparison when looking at prices. It’s a guide to help you in forming questions for the company you may use, although we hope you’ll give us strong consideration! First and foremost, it’s important to know that there are two very distinct processes in creating an acrylic print with two different outcomes – direct printing onto the acrylic substrate and the face mounting method of printing onto the photographic paper, then mounting behind the acrylic. 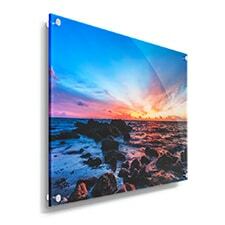 We’ve been producing face mounted acrylic prints for a decade now so have seen a lot of changes in the industry over the years particularly in the way acrylic prints are produced and where. When we started it was just a handful of boutique print companies in the USA and Europe producing high-quality face mounted prints. 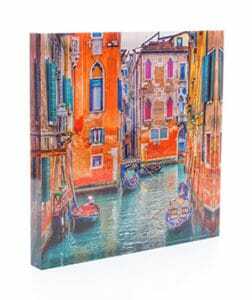 In recent years that has changed completely with just about every company now offering some variation of an acrylic print (including canvas companies) with wide differences in quality of components, craftsmanship, and certainly price. For gallery quality art, which is what we currently focus on, we wouldn’t consider the direct print method as it leads to inferior results in terms of color accuracy, vibrancy as well as permanence (color fading). We believe for fine art applications photos were meant to be printed on paper and produced at the highest quality. You can see more on our acrylic photo mounting process here and below is a video showing our process (please note we have made some improvements to the product and process since this video was shot but the gist remains the same). So, Question #1? Where are the acrylic prints made? Is it outsourced? In the last couple years or so we’ve seen a big increase in companies outsourcing direct to acrylic prints to China, India and Mexico. In fact, at least 3 out of the top 10 companies listed in Google for the term “acrylic prints” outscource the product outside the US. The result is dramatically lower pricing but at a cost in color accuracy, vibrancy and permanence (ie color fading over time). Some of the big photo labs are even outsourcing the face-mounted acrylic prints as well but that typically happens in the USA to better control the quality of a difficult process. Here at Bumblejax, the entire process is in-house at our Seattle facility so that we can control the quality from beginning to end. Every single file is manually reviewed for print quality, flaws, color suggestions, etc before going to print. From there, the acrylic print is produced free of defects and inspected before being packaged to ensure the highest quality. Question #2? Do you print to the acrylic directly or face mount by printing onto paper first then mounting? 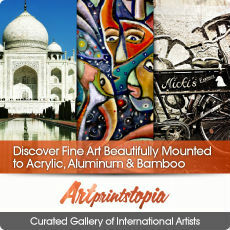 You’ll find that companies who print directly to the acrylic with a UV printer are able to offer it at a cheaper price (particularly if outsourcing outside the US), so if you don’t mind giving up some color accuracy, vibrancy, and permanence this may be a good option particularly for outdoor spaces and signage where it’s not as critical. The face mount process is more labor-intensive and there aren’t many companies doing it well on a consistent basis. It isn’t an easy process, but the end result is well worth it. Question #3? Does the price include “gallery quality”? This is only a question to ask if the acrylic print is face mounted. The machine made direct to acrylic prints won’t have this issue since the ink is added directly to the acrylic. What is typically considered gallery quality? While the quality of the components are certainly critical and we’ll get into that in a bit, in this regard we’re referring to the acceptable level of imperfection that can arise during the acrylic face mounting process. In particular, dust specs and bubbles that can get trapped between the acrylic and the print itself. This is a common problem which is why most companies won’t take it on and just print directly to the acrylic. Having to redo an acrylic face mount is expensive especially if it has to be redone a few times! Most photo labs offering acrylic face mounting get around this in one of two ways – by offering “gallery quality” as a high-priced upgrade option or using a disclaimer that says the price being offered may include visible imperfections. At Bumblejax, our pricing always includes gallery quality and yes that means that sometimes we redo prints (sometimes more than once). We just aren’t comfortable offering anything less. Question #4? What kind of backing material is used? Unless the company doing your acrylic print is printing directly to the acrylic and using stand-off bolts, there is a good chance that a backing material will be used to protect the print, attach hanging hardware as well as stabilize the acrylic. This is important. This will generally consist of two materials – sintra, dibond or possibly another sheet of acrylic. Sintra is high-density plastic and cheaper than dibond but provides less stability for the acrylic. This may lead to some bowing of large acrylic pieces over time. Dibond, on the other hand, is more rigid, providing much greater rigidity of your print, but is more expensive. Dibond is basically a polyethylene core sandwiched by two pieces of thin aluminum and it’s the material we prefer for stabilizing your print. For smaller pieces, sintra is probably OK, but if you’re ordering larger pieces be sure that dibond is used. Another sheet of acrylic is another backing option and provides a really nice high-end look. We’ve done these types of jobs before, but similar to sintra, it should really only be used on small to medium-sized acrylic prints. For prints above about 40″ or so, a full box subframe should really be used in addition to dibond to provide further rigidity for the acrylic print. Question #5? Do you use stand-off bolts? Using stand-off bolts to secure an acrylic print to the wall is common, but we prefer the floating off the wall look where all the hardware is completely hidden. This is the configuration you’d typically see in a gallery setting. While acrylic prints can be offered much cheaper using stand-off bolts since a backer material isn’t needed, we believe these are a distraction to the image. That said, we do have customers that prefer it for various reasons (ie to match existing prints they already have or to provide better security), so can provide this option as a custom order. The vast majority of our acrylic prints are produced with hidden floating and hanging hardware. If security is a concern for you we have a french cleat solution with locking security hardware. Question #6 How thick should I go with the acrylic? Many companies will offer an acrylic print in thicknesses of either 1/8”, 1/4” or both. The 1/4″ thickness would be considered a typical gallery configuration while the 1/8″ acrylic still offers a great vibrant look at a more affordable price. The thicker 1/4″ acrylic will have more of a 3D edge particularly if it’s polished (we offer both a diamond polished and routed edge nd recommend polish on the 1/4″). Far less common is 1/2″ acrylic, but you’ll find it as an option here at Bumblejax up to 40×30″. Finally, an increasingly popular option are the acrylic photo blocks which at 1″ thickness make for a great standalone art piece. When we started offering these several years ago there were just a couple companies in the US offering them, but now you’ll see them everywhere as well. Unique to Bumblejax, we offer these blocks in large sizes such as 18×12 and 20×15 including some great pano sizes for those iPhone shots at 16×4 and 20×6. We also offer an elegant hanging option. Question #7 What kind of paper and ink should I use? An entire article could be dedicated to which paper and ink is best and there are still arguments on both sides as to which is best. When doing your research on acrylic prints using the face mounting technique you’ll come across C prints or inkjet prints. C prints use more traditional chemicals and emulate a darkroom process using LED’s or lasers while inkjet uses dye or pigment based ink with inkjet printers. Inkjet technology has rapidly improved over the past decade or so and many believe it has surpassed the quality of the C print. We do not offer C prints and prefer pigment based inkjet prints for better color accuracy and permanence. The C print process also can be significantly toxic. As for papers, you’ll typically see two options popular with acrylic prints – some kind of satin/lustre paper and a metallic paper. The metallic paper is very popular and can provide even more depth and pop to your acrylic print. Question #8 What type of acrylic is offered? There are many different brands of acrylic out there with varying degrees of quality. Acrylic suitable for face mounting should typically be cast acrylic 100% free of impurities. Our regular acrylic is a high-grade acrylic that meets our guidelines for gallery quality. There are two other types of acrylic you’ll see out there when looking around – a 100% non-glare acrylic and an anti-glare acrylic that diminishes it. We have tested many varieties and everything in between over the years and aren’t a big fan of 100% non-glare acrylic since it diminishes the vibrancy and can sometimes add a color cast. However, we can do it custom for you. A best of both world’s alternative is the TruLife acrylic which by our estimates reduces glare around 25% while providing additional benefits such as more UV protection, better scratch resistance and anti-static properties to minimize dust. While we do offer it as an option in our online ordering page and it’s a nice option for some of our customers, it does add considerably to cost and is only available in the 1/8″ thickness. NEW! A newer option we just added for our customers is an anti-glare option that doesn’t have all the benefits of the Trulife, but does offer better reduction in glare (50% by our estimates) at a significantly lower price than the Trulife. Question #9 Is the company well reviewed? Many shoppers check the reviews of a company before making the decision to purchase from them and that’s a good idea! Just be sure the reviews are listed on a 3rd party site such as Facebook, Google, Yelp, Trustpilot, Ekomi, etc. A good tip when shopping for anything online – don’t trust reviews on the company website since they can be filtered or fake. This can happen on 3rd party sites as well, but much less likely. We’ve been completely transparent for many years and every customer that has purchased with us gets a link to review us good or bad. You can see our 2000+ reviews in various places online here. As is the case with the acrylic prints for the wall, the 1″ thick acrylic photo blocks have become very popular. When we started offering these several years ago our only competition was Shutterfly in the entire US. 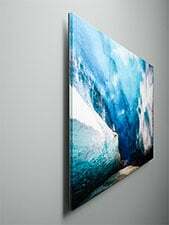 We wanted to offer a gallery quality acrylic photo block in several sizes including large and panoramic sizes and they were and still are tremendously popular. That has brought competition and lots of it. Unfortunately, as is the case with the acrylic prints for the wall, the acrylic photo blocks are not created equally across print labs. Some of the questions to ask of the company producing your acrylic blocks (we hope that’s us :D), will be the exact same as above, but it’s worth mentioning briefly here again. Question #1? Are they made in house or outsourced? Companies are increasingly outsourcing their printing even for one off on demand products. It’s far more difficult to control quality and this is even more pronounced with the 1″ acrylic photo blocks. The 1″ diamond polished edge should be perfect and free of chips and scratches and the print free of bubbles. Question #2? Does the price include “gallery quality”? This is really important because many companies aren’t going to replace your acrylic block if there are small defects such as a chip or a noticeable scratch. Ask them what their policy is and get it in writing. 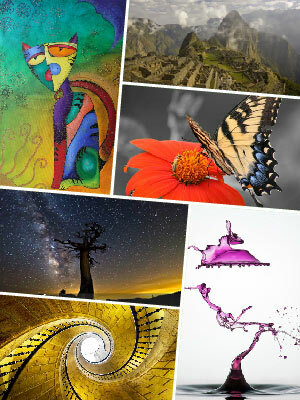 Our pricing includes gallery quality meaning free of noticeable defects in any part of the block. Our customers, and resellers in particular, rest easy knowing the quality is guaranteed. Question #3? Are the blocks 3/4″ or 1″? It’s easier to get a 3/4″ thick acrylic block polished than a 1″ block not to mention the material is cheaper. A few companies out there are moving to 3/4″ blocks so know what thickness you’re getting. The thicker the better in terms of vibrancy and stability. Question #4? Printing directly to the acrylic block or printing to paper and mounting? This is an important difference since the direct to acrylic printing will sacrifice some vibrancy and color accuracy. It’s cheaper to produce and what the big labs do like Shutterfly and Mpix. Printing to paper and face mounting to the block will yield superior results in this regard. If you’re ordering quite a few blocks, order one of each and see the difference 🙂 Interestingly enough some of the direct printing to acrylic block products out there are priced higher than the face mounted blocks. We hope this guide has helped you to navigate the complexity of buying acrylic prints and photo blocks and allows you to make a more informed decision about quality and price. The old cliche of you get what you pay for certainly applies to the printing industry. If you have any questions at all about this article or the acrylic prints process feel free to reach out to us via email, live chat or phone and we’d be happy to help.